The original Super Mario Bros. is tightly optimized, as far as speedruns go. Runners have been shaving off milliseconds using highly-skilled play and glitches, all in the hopes of someday reaching a theoretically perfect run. Previously, this was only achievable using special programs, but last night, a runner did what some people thought impossible, matching those computer-assisted performances with nothing but grit and skill. Kosmicd12 is one of the most well-known Super Mario Bros. runners, thanks in part to a back-and-forth string of world records claimed by him and another runner named Darbian in 2016. The classic NES game was already thought to be highly optimized back then, with a world record that stood uncontested for three years. New glitches, including a means to grab and later skip the end-of-level flagpoles, drove the record lower and lower. But those new records came down to fractions of seconds. As the time shrank, runners began to wonder how much more time could even be saved even as they made minute improvements. A tool-assisted run, which uses special programs to allow creators to play perfectly, achieved a time of 4 minutes and 55 seconds. (There’s a faster TAS although it’s much less comparable to what a human might actually perform.) Segmented runs, which combined runners’ best performances throughout multiple runs, showed it was theoretically possible for a human to achieve but not realistic . Kosmicd12 achieved the first human-performed 4:55 last night, pushing the game to its limit in the process. The miraculous time came after Kosmicd12 managed to tie the then-current record, a 4-minute, 56-second, 245-millisecond world run by a player named”somewes.” After taking time to review the run, he decided to try out a new trick in world 1-2, which would save a single “frame-rule.” Frame-rules are a strange quirk of how Super Mario Bros. handles how long it waits before loading the next level. Small improvements allow runners to arrive closer to the times when the transitions occur. Those times are highly regulated, so managing to save time and arrive closer to those transitions can save valuable frames and time. In this particular case, it was a highly precise trick that allowed him to clip through the end-of-level pipe and access a warp zone faster. It was his first time pulling it off, and he carried the run all the way to the end for a final time of 4 minutes, 55 seconds, 913 milliseconds. While it’s highly unlikely that 4:54 will ever happen with new glitches, It’s hard to say if 4:55:913 will remain the best of all possible times. 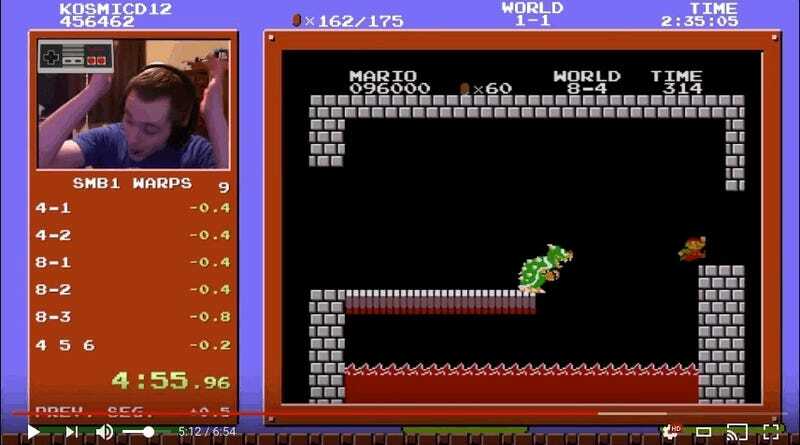 By repeating what Kosmicd12 did, Super Mario Bros. runners might shave a millisecond or two off, but being the first human to crack the 4:55 barrier is still a monumental achievement that snagged a formerly mythical time from the jaws of supposed impossibility.